O.R.k., the international prog rock band have signed to Kscope and will release their new album, Ramagehead, in February. It sees the band working with System Of A Down singer Serj Tankian who features on the first single, Black Booms. 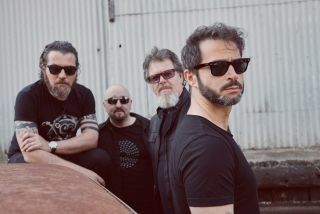 The band, who feature King Crimson drummer Pat Mastelotto, former Porcupine Tree bassist Colin Edwin, and Italian singer Esposito Fornasari and guitarist Carmelo Pipitone, have released a trailer for the new album, which you can watch below. Ramagehead was recorded in Italy, USA and the UK and features cover art from Tool's Adam Jones.